ELEVEN MOTORISTS ACCUSED of dodging M50 tolls were hit with fines totalling in excess of €126,000 yesterday. The penalties ranging from €2,500 to €15,000 were handed down by Judge Anthony Halpin at Dublin District Court. Another motorist who allegedly used Ireland’s busiest motorway 800 times without paying is contesting his case and will face trial in April. In all the prosecutions which resulted in the fines imposed yesterday, none of the defendants appeared for their hearing. Each one featured five sample counts and photographic evidence of how many times the defendants’ vehicles had been detected using the motorway without paying the charge. The court heard the evidence showed the passage of the vehicles, mostly private cars, on the barrier-free motorway on dates in May, August and September 2018, as well as proof of vehicle ownership at the time. The M50 is operated by Transport Infrastructure Ireland (TII). Judge Halpin expressed concern at the financial and environmental cost of thousands of letters being sent to these motorists by representatives of TII as a result of the non-payment of the tolls. On top of the fines, which added up to €126,500, each vehicle owner was ordered to pay prosecution costs. 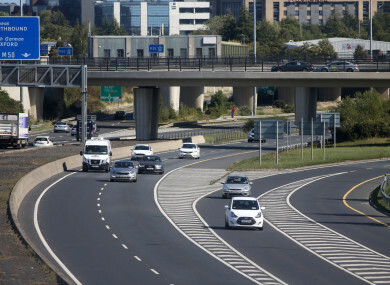 Prosecution counsel Thomas Rice BL, said the TII witness who presented the evidence had certificates of ownership as well as images of the vehicles passing the gantry on the M50. The court can impose fines of up to €5,000 per charge. Claire Burke, of 220 Balbutcher Lane, Ballymun, Dublin was fined €9,000. Judge Halpin heard she was the registered owner of a private car which had a history of 230 journeys and no payments. Some 500 letters were sent to her, said TII witness Sarah Kavanagh. Judge Halpin gave the motorist six months to pay the fine along with costs of €265. Marina Stan of 45 Aulden Grange, Santry, Dublin, had not paid for 215 journeys by her car on the M50, the court heard. For her five sample charges arising from journeys in September, Judge Halpin fined her €12,500 and ordered her to pay costs of €375. Danielle Riccardo Muntean, with an address at 14 Castlesize Drive Sallins, Co. Kildare, was the owner of a car that made 284 trips on the motorway and had paid five times. Some 1,800 letters were sent to this motorist about the unpaid tolls. On the five sample charges, Judge Halpin imposed fines totalling €12,500 and awarded prosecution costs of €375. David Tyrell, with an address at 34 Fairlawn Road, Finglas, was also fined €12,500 with an order to pay €375 in prosecution costs. The court heard his vehicle had a history 728 passages with no payment. Some 2,000 letters had also been sent to him from 2017 to date and there had been no replies, the court was told. Daniel O’Donnell, with an address at 11 Shancastle Drive, Clondalkin, was also fined €12,500 with an order to pay €375 in prosecution costs. His car used the motorway 249 times with no payments. He would also have received approximately 700 letters about the unpaid tolls but there was no reply, the court heard. Judge Halpin dealt with this case after first establishing that this defendant was not the famous Donegal singer, and co-star with his wife of Daniel and Majella’s USA Road Trip. Niall Branigan Bedford, of 15 Marian Park, Drogheda, Co. Louth, was handed fines of €2,500 with an order to pay €375 in prosecution costs. Judge Halpin noted this defendant was the registered owner of a car who had paid for nine out of 132 trips on the M50. Rebecca Shanley with an address of 4 Corngower Park, Brittas Bay, Co. Wicklow, owned a car that had done 152 trips on the M50 without paying and 400 letters were sent to her. She was fined €10,000 and ordered to pay €375 in prosecution costs. Thomas Kennedy, with an address at 44 Glenmore Park, Ballyboden, Dublin was handed fines totalling €12,500 and ordered to pay €375 in prosecution costs. The court heard his vehicle had used the motorway 185 times without paying. Some 500 letters were sent him but there was no contact from him. Commercial vehicle owner, Philip Johnson, of St Marks, Robin Hood Road, Clondalkin, Dublin, had been the owner of a truck which had done 592 trips on the motorway, the court heard. There were no payments received. The court heard that defendant had been sent 1,500 letter. He received fines totalling totalling €15,000 and was ordered to pay €375 costs. Alf Rushmer, of 16 Killarney Parade, Phibsborough, Dublin, was given fines that came to €12,500 and was ordered to pay €375 in costs. Judge Halpin was told his commercial vehicle had a history of 318 passages without any payments despite being sent 900 letters. Victor Ekanem, with an address at 73 Tailteann Drive, Windtown, Navan, Co. Meath, was the owner of a car which had a history of 489 passages with no payments despite being sent 1,400 letters which were unanswered. Judge Halpin fined him €15,000 and ordered him to pay €375 costs. The court heard yesterday that it was TII’s policy to negotiate with defendants and a number of other cases on the list were adjourned while some others were struck out after resolutions were reached. The standard M50 toll for an unregistered private car is €3.10 must be paid before 8pm the following day or else there is a €3.00 penalty for having missed the deadline. Email “Fines totalling more than €126k in court crackdown on M50 toll dodgers ”. Feedback on “Fines totalling more than €126k in court crackdown on M50 toll dodgers ”.